Msgr. 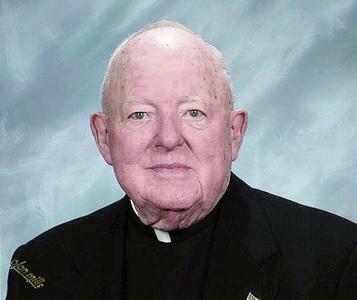 Daniel J. Kehoe, 100 and Philadelphia’s senior priest, died Oct. 19. The pastor emeritus of Holy Spirit Parish, Sharon Hill, he was also an educator for 30 years including service as principal of two high schools. Born in Philadelphia, the son of the late Patrick B. Kehoe and Mary Gertrude (O‘Donnell) Kehoe, he attended Holy Rosary School and West Philadelphia Catholic High School. After two years at West, he followed the example of his uncle, Father Daniel Kehoe, for whom he was named and entered St. Charles Borromeo Seminary. He was ordained June 3, 1939, by Cardinal Dennis Dougherty at the Cathedral of SS. Peter and Paul; his ordination class included 52 men, of which he was the last survivor. His first assignments were as parochial vicar at St. Laurence Parish, Upper Darby, and to the faculty of St. Thomas More High School, where he taught until 1957 when he was asked to become principal of the newly opened Bishop McDevitt High School. In 1962 he became principal of Bishop Shanahan High, then in West Chester. “There is nothing more satisfying than to be a teacher, to see young people grow,” he said in 2009 when he was named monsignor. “He loved his priesthood and he was a great proponent of Catholic education and wanted to be active as long as he could,” said his niece, Sister Rita Therese, S.S.J. She recalls that during her childhood he was “Uncle Dan” to the children but everyone else called him “Father Dan.” He was a lot of fun and she well remembers going to Tommy More games with him rooting for the Golden Bears. But prayer time was something else and the children had to be quiet when he was praying his breviary. In 1969 he was made pastor of Holy Spirit, an office he held until his 1987 appointment as pastor emeritus. Nevertheless he remained a beloved resident in the parish virtually until his death. Msgr. Kehoe was perhaps best known recently in the archdiocese as one of the priests who was authorized to celebrate Mass in the Latin extraordinary rite when it was introduced, something he did because most younger priests had not been trained in it. Up until about three years ago he would drive from Sharon Hill to Our Lady of Consolation in Tacony on a rotating basis to celebrate the liturgy. He only stopped driving because macular degeneration affected his eyesight, Father Woodeshick explained. An avid reader and follower of sports, this affected his ability to read his breviary, and at first he purchased a large-print breviary and when that became too heavy to hold, a stand for it. When the condition worsened he purchased a goose-neck lamp with an attached magnifying glass, but ultimately this too was insufficient, and in the end he substituted the rosary for his breviary. Despite the physical disabilities of extreme age, his mind remained sharp until the very end, Father Woodeshick noted. Father Kehoe’s funeral Mass will be celebrated by Archbishop Charles J. Chaput at Holy Spirit Church on Oct. 25 at 10 a.m.
Concelebrants will include Msgr. Daniel J. Sullivan, Father Joseph L. Maloney and Father Woodeshck, who will be the homilist. Msgr. Kehoe is also survived by his niece, Frances Barrett. PREVIOUS: Sister Mary Joanne McKelvey, I.H.M. NEXT: Sister Mary Joan Unsinn, I.H.M.